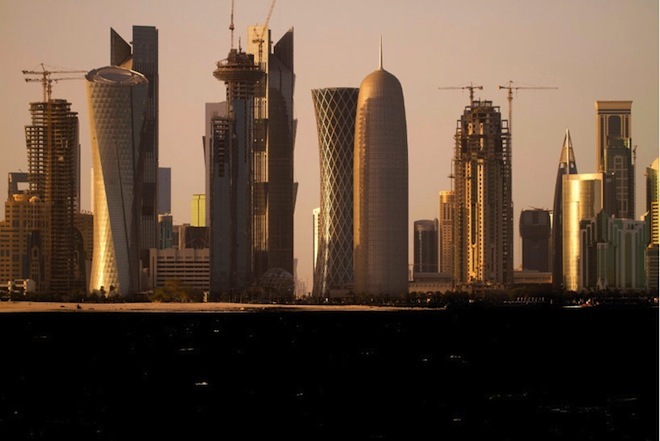 Cousin to the world’s tallest building, the rounded silhouette of Burj Doha soars over the capital of Qatar’s skyline. 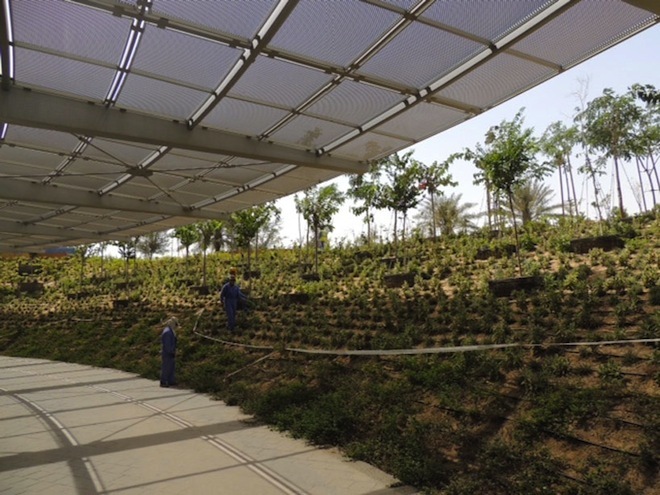 Designed by Jean Nouvel, it is the first building in the emirate with a vertical garden, and check out that modern mashrabiya. The mashrabiya is an ancient Islamic screen that was used to promote natural cooling during hot summer months in desert environments without compromising privacy. 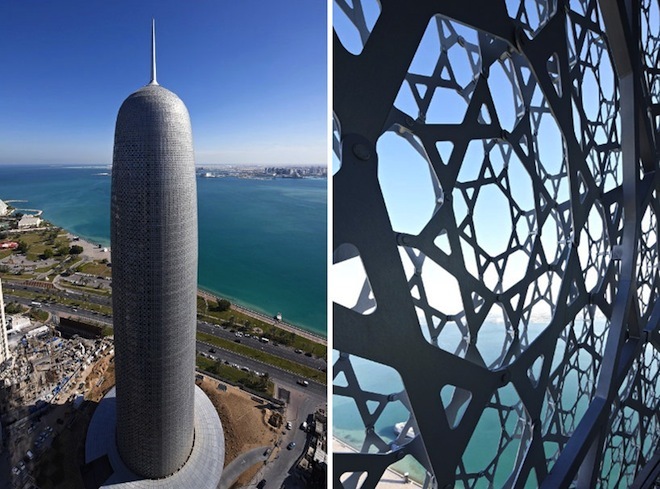 It took a while, but contemporary designers working in the Middle East, including Foster & Partners with Masdar and a beautiful bank in Morroco, and now Jean Nouvel, have learned to incorporate these tested design strategies into modern architecture. 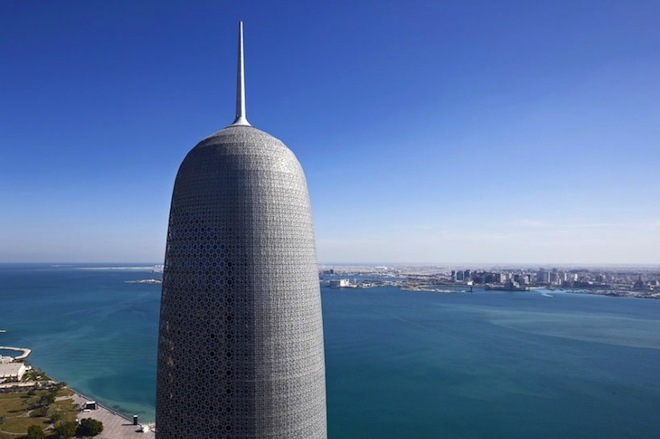 At 761 feet, the Burj Doha is tiny compared to the 2,722′ Burj Khalifa in Dubai (currently the world’s tallest building but soon to be eclipsed by projects in China and Saudi), yet its prominence on the waterfront is in no way diminished by its smaller stature. In fact, the Burj Doha was recently named the world’s best tall building by Chicago’s Council on Tall Buildings and Urban Habitat. Frankly, we don’t lust after the world’s tallest this and that, nor are we wild about materials such as glass and concrete, but we do want to draw closer attention to the tower’s attributes that we can support. The layered screen that resembles both the mashrabiya and shanasheel screens of old dapples fierce sunlight, creating a mesmerizing interior affect while also taking a lot of pressure off the cooling system. 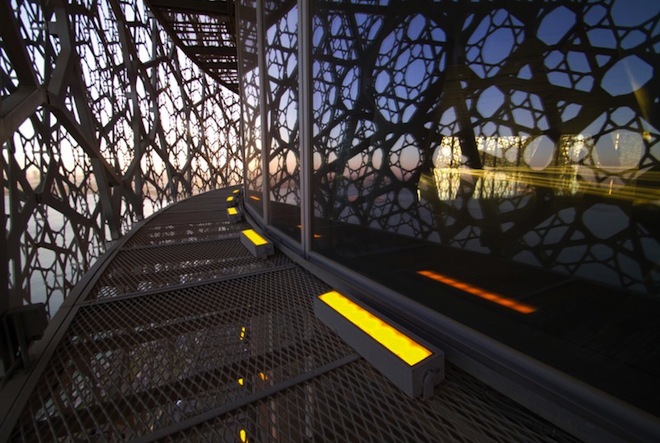 Nouvel is the first to successfully use dia-grid reinforced concrete in this application, according to Designboom. Also unique to this tower and indeed to all of Qatar for now is a vertical garden that contributes to an improved microclimate. This combined with plenty of other green space offsets, just a little bit, some of the emissions associated with the mad development that has gripped Doha. And that’s before the World Cup 2022 construction frenzy starts! Thank you for your insight and photos, but is Burj Doha open for tourists? Can we actually enter and visit the upper floors? This is very interesting, but, try as I might, I couldn’t find the vertical garden mentioned in the headline. Where is it?